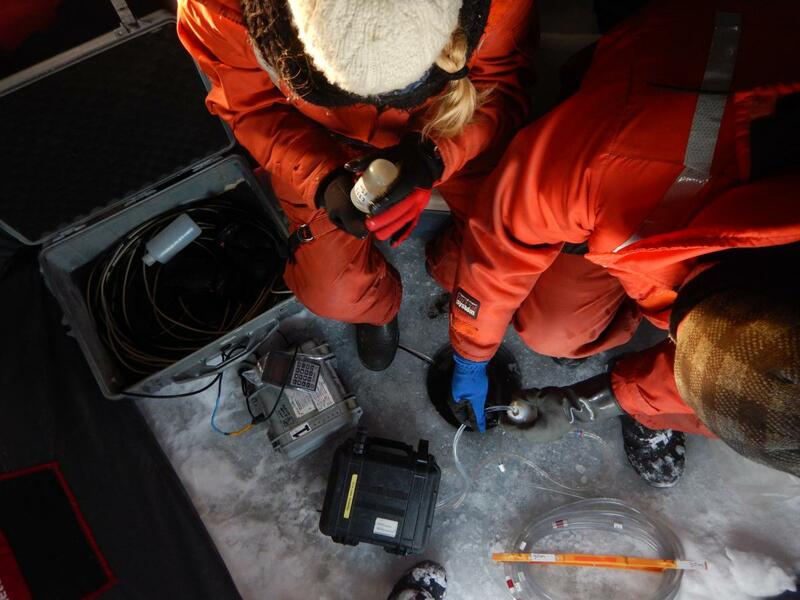 In the last 47 years, researchers at IISD-Experimental Lakes Area (IISD-ELA) have discovered a lot about the effects of climate change on lakes and freshwater. And one of the things they have discovered is that our lakes are getting less icy and are icing over for shorter periods of time. In the second part of our series looking at the work that is happening at IISD-ELA regarding climate change, we take a look at what we have learned in greater detail. In many parts of the Northern Hemisphere, researchers have documented shorter winters and a reduced duration of ice cover. They have also discovered that the duration of the winter period where lakes are ice covered is getting shorter and shorter over time. Such patterns are also evident throughout the boreal zone of Canada. Since 1969, we have measured the duration of ice cover, including the day the lake surface is >90 per cent frozen (ice-on date) and the day >90 per cent of lake ice has melted (ice-off date), on one of our main study lakes. The data show that the period of ice cover has declined by 18 days over the study period at a rate of 4.24 days per decade. While additional factors such as lake size and wind speed are important, there are very strong relationships between air temperature and ice formation and melting on lakes. Using these relationships, it is possible to estimate how the duration of ice cover will change based on changes in air temperature predicted by global climate models. For example, based on regional climate projections for Northwestern Ontario, the duration of ice cover is projected to decline by an additional 20–30 days by 2070. Figure 1. Long-term changes in ice cover on Lake 239 of the Experimental Lakes Area. 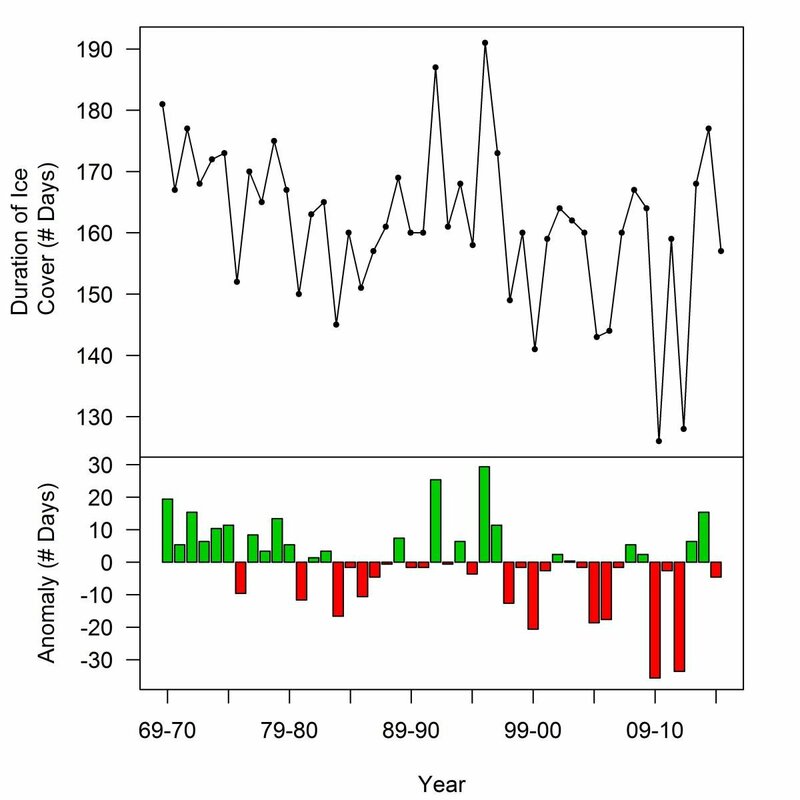 The lower panel shows the deviation in each year from the long-term average duration of ice cover. ​The duration of ice cover on lakes is important for winter roads into remote northern communities, and recreational activities such as snowmobiling and ice fishing. These activities are of large economic importance to communities, bringing in supplies and significant tourism during the winter period. The duration of ice cover is also very important to a large number of physical, chemical and biological processes in lakes. As the snow and ice melt, sunlight that heats the water and is required for photosynthesis increases dramatically. Increases in plant growth supply the food and energy requirements for all resident species from small bugs to fish such as lake trout. Longer summers are good for some fish species, allowing them more time to grow and achieve sufficient energy stores before the next winter sets in. However, some fish species, such as lake trout, require cold temperatures and highly oxygenated water to survive, and their most intensive feeding periods are in the early spring and late autumn. For these fish, longer summers can mean a longer period between spring and fall peak feeding times and increased potential for oxygen levels to fall below their requirements (loss of habitat). For this reason, lake scientists (also called limnologists) and fisheries scientists are very interested in how climate change will influence the duration of ice cover.